Looking for inspiration for your next project? Spring cleaning? Browse through our blog for practical ideas and things to watch out for when looking for professional painting services in Sydney. Call us on (02) 9929 4966 for more information. Tiny Kitchen: You don’t have to steer away from dark colors in a small kitchen. In fact, having a mix of contrasting colors can help the kitchen feel larger. Depending on your cabinet color, a strong paint that has enough blue and red in it, as well as gray, can make it work with a variety of other colors. Adding rows of shelving and utilizing the kitchen’s vertical space can help break up the paint while maximizing storage. Open Floor Plan: Open kitchens, with nearby dining rooms or family rooms, will need to be color-conscious when it comes to walls. Not only will your paint color need to match the kitchen elements, you’ll want to make sure that it coordinates with the other rooms as well. When selecting a color, try a gray-infused neutral that will go with a variety of color palettes. Lots Of Wood Cabinets: If you have a lot of wood cabinetry in your kitchen you’ll want to be smart about your color selection. Do you want the cabinetry to disappear? Try a paint color that is a shade or two lighter than the cabinets. Do you want to compliment the wood and show it off? Find a paint color from a different palette that has complimentary tones. Outdated Countertops: If all you can afford to do is repaint your walls, don’t worry. Paint can help downplay or distract from any unattractive features in the kitchen. Colors that dominate, or play up your favorite color, will do well. Consider painting three of the walls the same color as the cabinets (to hide them) and use the fourth wall as a strong accent color. Stainless Steel Appliances: Stainless steel appliances have a cool, but gray, appearance, making them a good neutral for the kitchen. However, kitchens with too much stainless steel in the kitchen run the risk of looking cold and utilitarian. Offset the cold by introducing a warm color. Black Appliances: Black appliances, like stainless steel, can look cold and dark. In some kitchens they may appear like black holes within the space. So balancing these strong elements is key for the kitchen. Depending upon the cabinet colors, a warm brown can create a sophisticated look next to black. Investment Property: The best reason for using a neutral paint color on the wall of a rental is that it will be much easier to paint over over once tenants vacate. But neutrals don’t have to be boring. If you prefer cool tones, a gray-blue color will work with nearly any color scheme. Warm neutrals will also work well. If You Have A Dark Backsplash: Do you want your backsplash to stand out or disappear? If you want it to stand out, then choose a much lighter color. Some black backsplashes can pair well with similar dark colors as well. If You Have A Light Backsplash: Light backsplashes, like white or cream, can work well with a variety of paint colors. A bright chalk white will really show off the veining in white marble, for example. Sophisticated grays like can also be a great compliment to light colors. Be careful about really dark colors next to white – the color may reflect onto the surface and change the color to one you don’t want. If Your Kitchen Also Functions As An Entryway: If your kitchen serves as the main entry to the home, you’ll want to be less conscious of the color and more aware of the type of paint you use. Be sure you select a paint designed for heavy traffic and can easily wipe down, like a semi-gloss finish. Texture is important too. A smooth wall will show marks faster than a more textured one. What If Your Favourite Paint Colour Won’t Work On your Kitchen Walls? Don’t forget that paint can be used on a variety of kitchen elements: cabinets, tables, chairs and other decorative objects. If your favourite paint colour won’t work on the walls, try using it on a piece of furniture instead. Vintage pieces or new pieces can be painted (or spray painted). 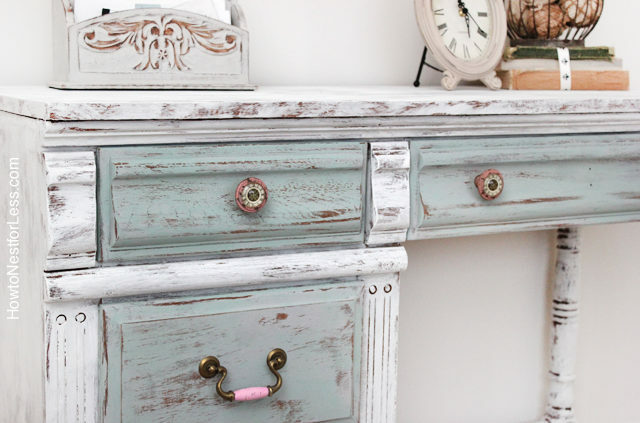 For a beachy look why not try Chalk Paint? Test the underside or backside first to make sure you’ve selected the right type of paint for your project. What Aspect Does Your Kitchen Face? Choose The Right Colour. Painting your kitchen walls is one of the quickest, and easiest ways to re-do a kitchen. Before you rush out and buy gallons of paint, think carefully about what your dream kitchen looks like. Experts agree that it’s not just the color on the walls that determine how a kitchen looks and feels. There are many influencers. Before you buy paint, test sample swatches on your walls and observe how the colors look at various times during the day and evening. Which way does your kitchen face and how much light comes into it? Keep in mind that natural sunlight in the kitchen will change in intensity throughout the day. Morning light appears differently than evening light, and shadows can affect the color perception. Color is essentially light – how we perceive a color depends greatly on how light is reflecting off of that color. There is a term used to describe this color-changing experience: illuminant metameric failure. It simply means that two colors may look similar in one light condition but might not match in another. So understanding the light patterns in your kitchen, and knowing what other colors will be going into the kitchen, is incredibly important. Northern Exposure: Northern light is cool, indirect, and even in appearance, making it the preferred light of artists and painters. Light from northern exposure won’t shift as much throughout the day, so expect a more even color tone in the room. The cooler sun rays will enhance cooler colors like blues and greens. Even cool tones of white will look good in northern light. Southern Exposure: Southern light is stronger, more direct and tends to shift throughout the day. 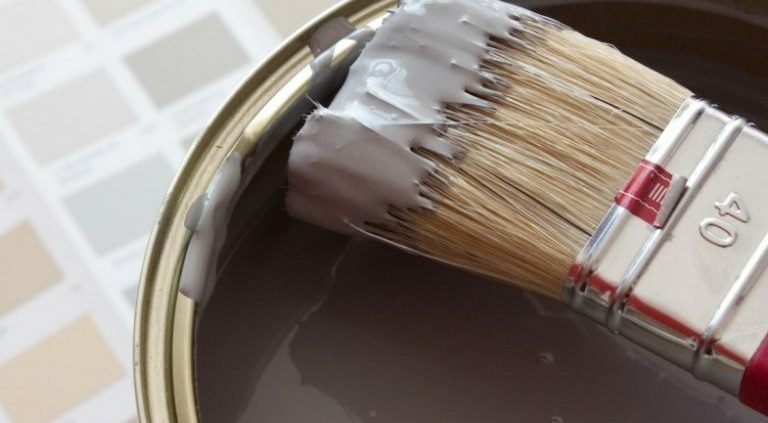 This might make your paint colors look very different at different times. You might notice that the strong sunlight makes paint colors reflect onto nearby surfaces. Kitchens with a southern exposure can do well with all walls being painted with the same color but keep in mind that during the day, each wall might appear to be a different shade. As the warm light will draw out warmth in the color, choose earthy colors. Eastern Exposure: An eastern exposure kitchen will have strong sunlight first thing in the morning and lots of shade in the afternoon. Expect shadowing throughout the day as the sun moves across the sky. You can play up the effect of the sun by having a kitchen with contrasting colors. Western Exposure: Kitchens facing west will have strong sunlight in the afternoon and into the early evening. Dark colors will help absorb excessive light (and heat). Combine strong cabinet colors with a lighter tone. No Windows: A windowless kitchen will need to rely on artificial light. The best kitchen will have a combination of task lighting, overhead light and ambient light and the types of bulbs you use will greatly influence the type of light. Incandescent and halogen bulbs cast warmer, more yellow, tones. These bulbs will bring out warmer hues and cast a warm glow in the room. Wishing all our valued clients a very happy, safe and prosperous New Year! How Does Temperature Affect Paint? Paints, varnishes and sealants applied in cold temperatures require extended drying time. In extreme cases, bitter cold prevents drying altogether. Heat has the opposite effect. Products applied in excessively hot temperatures dry too quickly and often develop bumps, blisters and other imperfections. Extreme temperatures also cause dried paints, varnishes and sealants to expand and contract. Paints exposed to severe cold often shrink and crack. This loosens the bond with the underlying surface and leads to flaking, chipping and peeling. Coatings applied in very hot weather are particularly vulnerable to cold temperature damage. Other weather issues, such as wind, precipitation and humidity also affect paints and other coatings. Products left to dry in heavy winds cure rapidly and without forming sturdy surface bonds. Strong winds also disfigure freshly painted surfaces by blowing dust, pollen and insects into the drying paint. Precipitation is a serious threat to proper drying and frequently ruins fresh paint jobs. Humidity is another concern, especially when painting moisture-swollen wooden surfaces. Paints, varnishes and sealants applied to waterlogged wood do not form reliable bonds and are prone to peeling, bubbling and flaking. Take all this worry away and contact the professionals at Sky Painters and Pressure Cleaners Sydney for a FREE QUOTE today. We look forward to helping you transform the look of your property! Deciding On Flooring For Your Investment Property? Why Not Choose Epoxy? Many people think that they can only use Epoxy flooring in their garage but why not use it for your Investment Property? Aesthetically pleasing to the eye, easier of clean, resistant to oil, salt, and most harmful chemicals, Epoxy floors maintain their beauty and integrity for many years to follow. Durability: Due to its durability and perseverance, epoxy floor coatings are used in many industrial and commercial buildings such as warehouses, factories, food and beverage plants, laboratories, commercial businesses and more. Epoxy coatings can promise you a more robust floor that may last for many years. These are also the reasons we are seeing it used more and more for residential housing and investment property. Easy To Clean: Dirt and dust can easily be wiped clean if your concrete floor is coated with epoxy. For this reason, epoxy floor coatings are perfect for facilities such as food and beverage, pharmaceutical and packaging plants. Beautiful Finish: With epoxy flooring, you receive a surface with an attractive high-gloss shine. Epoxy coatings can be found in different colours and styles, so you can be certain that there is a colour available to suit your taste. Chemical Resistance: Owners of factories, warehouses and industrial plants get their floors covered with epoxy floor coating to make their concrete floor chemical resistant. Improved Safety: As a home or business owner, you have to ensure that you create an atmosphere that is safe for your family and visitors. Epoxy coatings are formulated to resist impact, slip, heat or fire. Cost Efficient Flooring: When you consider the resistance to cracking, staining, fading and abrasion that Epoxy floor paint provides, the cost savings become obvious. By selecting an epoxy floor coating, you won’t bear the cost of replacing the carpets, tiles or linoleum, and you’ll eliminate the need for waxing and steam cleaning. 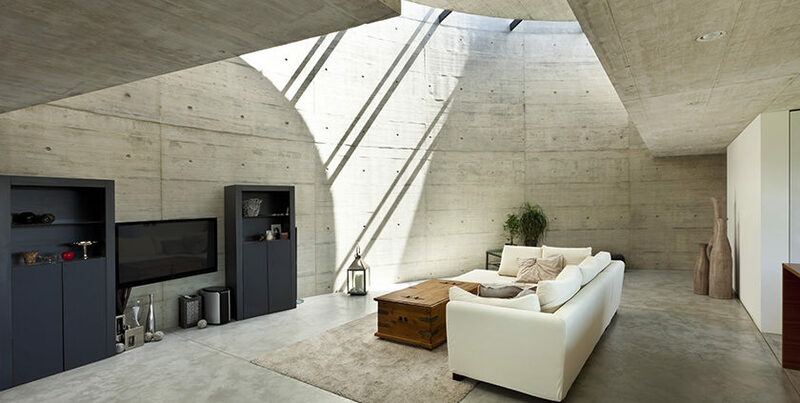 Better Comfort: Concrete isn’t a soft flooring option and many people use rugs to soften the look and feel of the room. Homeowners in hot climates often prefer epoxy floor due to the coolness that the coating offers. If you need quality flooring services that are not only professional, but also factor in the specific needs of your home or commercial property contact Sky Painters & Pressure Cleaners in Sydney. Explore our epoxy floor painting solutions or contact us today. A bedroom is a place for rest and relaxation so choose Neutral Colours. Bright colours are energising and invigorating. While these feelings are great properties for a living room, dining room, or kitchen, they are not appropriate for the bedroom. In a bedroom environment, it is better to choose neutral colours that help promote feelings of restfulness and relaxation. Beige, pale gray, and pastel colours are all excellent choices. Bedrooms require several sources of light. As well as an overhead light, a relaxing bedroom also contains bedside lamps, which can be used for reading late at night. When choosing bulbs for bedroom lamps, one should always choose bulbs that produce a warm light that is not too bright. A dimming overhead light is useful for creating different moods at different times of the day. Many experts agree that technology is the enemy of good sleep. People who choose to have a TV in the bedroom can reduce its impact on their sleep by installing doors to hide the screen. Instead of using a TV right before bed, people can do something less stimulating, such as reading a book. It is also a good idea to choose bedroom clocks that do not give off too much light or make a noise. Naturally, the bed is the focal point of the bedroom. People should invest ample time and money into making the bed as comfortable as possible. Memory foam mattresses can help to improve comfort while sleeping, as they mould themselves to the shape of the body. Some people love the feeling of sinking into luxurious silk or Egyptian cotton sheets, while others need to have plenty of pillows and cushions to feel comfortable. A bed is a very personal item, so it is important for each individual to make it match their specific preferences. Making the right choices when decorating the bedroom can greatly improve sleep quality and feelings of restfulness. Well-suited colours, window coverings, flooring, and lighting can help to create a peaceful sanctuary for sleeping and relaxing. 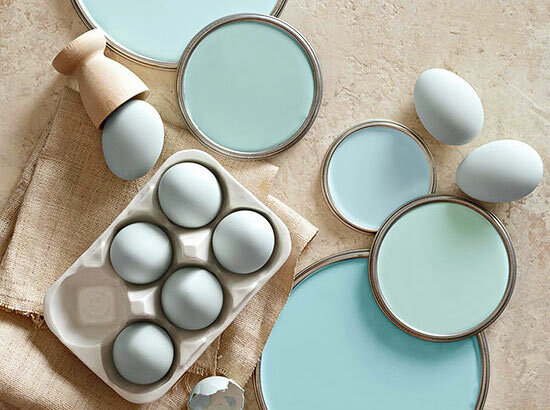 For a calm and subdued shade of blue that brings a sense of peace to a room, choose duck egg blue. This shade works for both masculine and feminine decor. You choose it for almost any room in the home. You can combine it with other similar shades to promote a room with colours that do not overwhelm, but instead blend with and complement each other for a classic and modern look. In the Bedroom: Use duck egg blue in a bedroom to give it a peaceful look and atmosphere conducive to sleep. Paint all four walls in duck egg blue or choose just the back wall near the bed’s headboard. You can also do two walls in duck egg blue and the other two walls in an eggshell white to keep with the egg theme. Add duck egg blue curtains and a duck egg comforter or quilt to complete the look. Decorate your bed further with duck egg and white throw pillows to offer contrast, but not an overwhelming contrast that takes away from the peace and tranquility of the room. Lampshades with duck egg blue can also add accents to the room. In the Living Room: Combine duck egg blue with cream to give you living room contrast. Choosing cream and blue can offer you a choice of furniture and accent pieces. Paint your walls cream and decorate with a duck egg blue living room set consisting of a sofa, loveseat, and recliner. You can have one cream lampshade on one side of the room and a duck egg lampshade on the other side. If you prefer lighter lampshades, choose a lamp with a duck egg blue base. Accent your furniture with duck egg throw pillows and blankets. In the Kitchen: Get creative in the kitchen with more than just your cooking. Use duck egg blue as part of your kitchen’s backsplash or paint your cabinets blue and leave the rest of the kitchen in a cream, beige, or white colour. You could also paint the entire kitchen in duck egg and coordinate the walls with stainless steel appliances for a modern look. While white appliances also work, stainless steel blends better with this shade of blue. For the Bathroom: The bathroom has lots of room for creative decor. The easiest way to incorporate duck egg is to paint the walls blue, but adding blue accents work well too. Start with a white base colour and add blue in little by little. Buy a duck egg blue shower curtain, bath and hand towels, and bathroom rubbish bin. You can also find a tissue box cover in duck egg blue. What is involved in the preparation and painting of my Property? The process explained. Protect roof and non-painted areas from paint drops and paint chips. Pressure Washing – A power wash eliminates algae, mildew, dirt, mould, and chalking that accumulates over the years and restores a clean surface for the paint to adhere to the home. 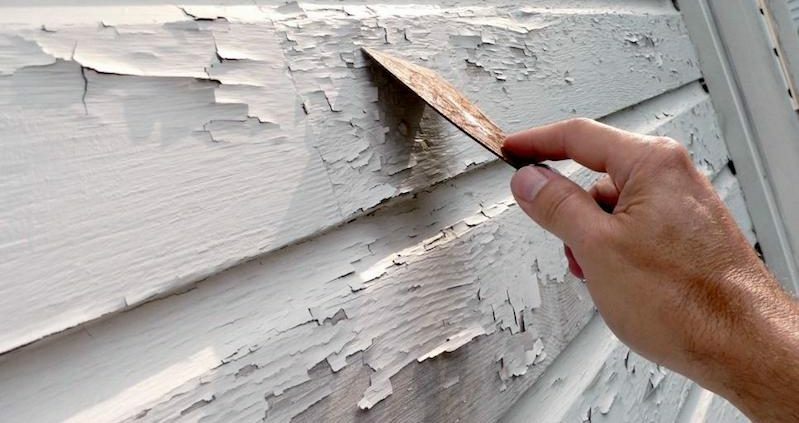 Scraping – The next step, which is typically completed in a period ranging from a few hours to a couple of days, involves scraping loose paint and/or stain that is peeling off the surface. Sanding – Amazing Painting then prepares for the siding’s priming by smoothing out the paint’s borders. Scraped areas can be hand sanded, and/or power sanded upon request when contracted. Light carpentry such as, clapboard, fascia, and sill replacement can be performed when contracted. Special priming is also done to certain problematic areas with cedar bleed or rust. Caulking is then applied to potential areas of water leaks, around windows, between joints, among other places. Amazing Painting also proceed to mask any nooks and crannies that they wish to protect from paint. All joints receive siliconised caulking to prevent moisture from penetrating behind wood. Paint is applied with brush and/or roller or sprayed and then back-brushed after all prep work is completed; we use sprayers on shutters, lattice and some hard-to-reach areas. What should I consider when choosing a colour for the exterior of my home?